Dr Anne Williams is a Nurse Consultant in Lymphology and a Lecturer in Nursing at Queen Margaret University. She has a long relationship with QNIS. Anne writes about a positive step forward in understanding, and dealing well with, a serious condition that too often is not taken seriously. I was delighted to be part of the latest meeting of the Scottish Parliament’s Cross Party Group on Women’s Health. The topic was lipoedema and I presented the findings of a recent research study undertaken at Queen Margaret University in partnership with Talk Lipoedema: (http://www.talklipoedema.org/). Lipoedema is a painful, chronic, life-altering condition that remains surprisingly unrecognised or misdiagnosed. Women are far more likely to be affected and their stories and struggles were highlighted at this welcome CPG session to raise awareness and point to needed actions. This was a cold January evening, with a red weather warning. Perhaps an inauspicious time to bring together key individuals, organisations and MSPs (including this CPG’s Chair, Monica Lennon). Yet, the room at Holyrood was completely filled with people keen to bring lipoedema ‘above the radar’ – and willing to brave the elements to listen, learn and contribute. I believe this session kick-started a move in Scotland towards recognising and addressing the needs of women with lipoedema and their families. For three years, I have been a Trustee of Talk Lipoedema; a registered charity that provides peer support for women with lipoedema. During my experiences as a District Nurse in London in the 1980s, and later, as a lymphoedema practitioner in Scotland, I remember meeting women with lipoedema, and never quite knowing how best to help them. Compression therapy was often a real challenge as their legs were an awkward shape, and often painful. Sadly, most community nurses (as well as other health professionals) are likely to have met women with lipoedema without diagnosing it accurately. The evidence suggests we have often mistaken it for ‘obesity’, or lymphoedema. Lipoedema, however, is a distinct condition, with specific signs and symptoms that can be identified on examination and palpation, for example: symmetrical enlargement of the legs and buttocks, often developing into bulges at the knees; poor ankle definition, with no foot swelling in the early stages; lax joints; soft skin and tissues that bruise easily and may be exquisitely painful on pressure. The Scottish Parliament’s Cross Party Group meeting began with a talk from Mr Alex Munnoch, a Plastic Surgeon from Ninewells Hospital, who is also the Patron of Talk Lipoedema. Alex is the only NHS surgeon in Scotland with experience providing liposuction for women with lipoedema. This is not a curative treatment but, as Alex identified in his talk, is part of the multi-disciplinary approach that we need to develop in Scotland to help women manage symptoms and improve quality of life. To date, just over 200 women have been referred to Mr Munnock at Ninewells, and 42 have undergone surgery, with most requiring a series of two or three operations. We do not know the prevalence of lipoedema in Scotland, but it does affect significant numbers. As a long-term condition, a key focus must be on supporting women with self-care. 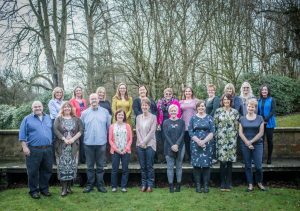 Our research at QMU, funded by the Carnegie Trust, explored the perceptions and self-care experiences of women with lipoedema in Scotland. We undertook interviews with 24 women and a focus group with eight women. The full findings will be published soon, but clearly show the need for timely and accurate diagnosis; practical support and advice on weight management and exercise; expert use of compression therapy; and, support with the accompanying mental health issues. Many of the personal challenges of living with lipoedema were eloquently shared by the final speaker of the evening, Anne Hendry. Anne has lived with lipoedema since puberty and brought the condition to the attention of Monica Lennon MSP, after having many difficulties in accessing support and treatment. Like many others, Anne was pushed ‘from pillar to post’, often disbelieved by health professionals, told she was ‘fat’, denied other treatments based on BMI (which is skewed by lipoedema). The CPG session was organised in response. Information on lipoedema is now becoming more available and women and their families can be sign-posted to organisations, such as Talk Lipoedema, for peer support. We hope that, in Scotland, we will soon start to see a growing awareness of lipoedema, with the condition acknowledged in public health documents relating to ‘obesity’, and a move to develop more robust services. Much more research and evidence-based information is required in the future. The Cross Party Group was an exciting step forward. Illustrating how change can be initiated through a blend of women’s voices and stories, research evidence, political elbow and professional expertise.